HELLO THERE. SPORTHORSE RETURNING TO DUTY. WHEN NOT DOING SPORTS COLUMNS FOR THIS BLOG, SPORTHORSE PAINT HOUSES TO PAY RENT. I KNOW, HOW DOES A HORSE PAINT WITH NO OPPOSABLE THUMBS, YOU THINK? LISTEN I CAN DO MANY THINGS, JUST BE QUIET AND READ THE DAMN BLOG. I CANNOT HIT THE CAPS LOCK BUTTON THOUGH I HAVE TRIED I AM SORY ABOUT THAT. SPORT HORSE WENT TO FISHBOX DERBY WITH FOALS OVER WEEKEND FOR THE FIRST TIME EVER TO PROVIDE YOU WITH A PLAY BY PLAY OF EVENT. SPORT HORSE NOT SURE WHAT TO EXPECT. IN GORTON PARKING LOT, MANY FISHBOX CARS WERE BEING PREPARED FOR RACING – EXTRA WHEELS, AXLES – THESE FOLKS ARE PREPARED FOR SERIOUSNESS. AND I AM LIKE, RACING IN CARS? I THOUGHT THIS WAS A DERBY WITH HORSES. THIS IS NOT A DERBY WITH HORSES. THERE WAS NOT EVEN A HORSE CAR. I HAVE BEEN DUPED. BUT SINCE SPORT HORSE IS GOOD SPORT (IT IN MY NAME), I STAY AND WATCH. AND HAD FUN! 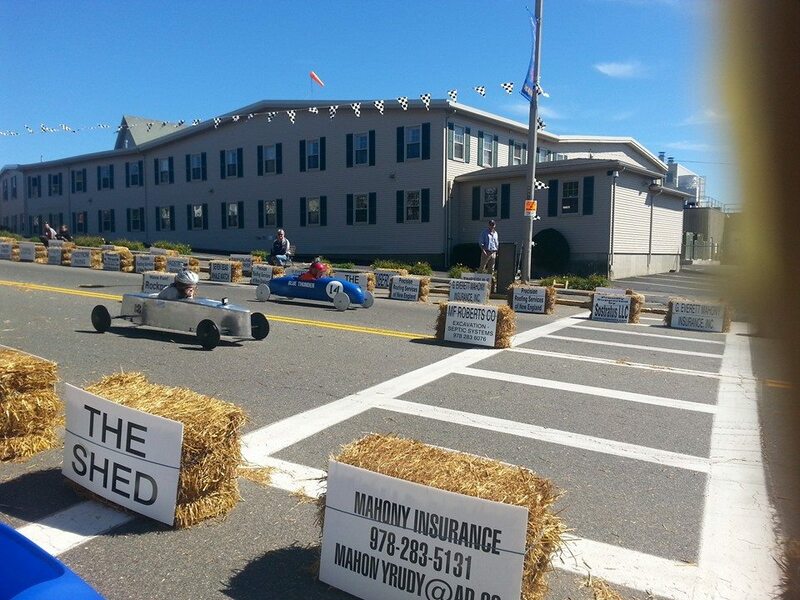 KIDS AGE 8-15 RACE SMALL CARS DOWN HILL IN 2 LANES AND TRY NOT TO SMASH INTO HAY BALE AT ENDS. THERE IS OFFICIAL TIME CLOCK AND EVERYTHING. IT KIND OF AWESOME! SOME KIDS SMASH INTO HAY BALES AT END. ONE KID PUSHED HAY BALE LIKE 30 FEET. I THOUGHT HE WAS GOING TO MANCHESTER BUT WHO REALLY WANTS TO GO TO MANCHESTER. RACERS GET TO GO TWICE, ONCE IN EACH LANE. THEY AVERAGE THE TIMES AND WHOEVER IS FASTEST WINS. MY FAVORITE CAR WAS ALLIGATOR CAR. ALLIGATOR CAR NOT FASTEST, BUT MOST AWESOME, AND THAT IS WHAT MOST IMPORTANT IN LIFE. NOT WINNING, BUT BEING AWESOME. SPORTHORSE LOVED ANNOUNCING. REMIND ME OF RACES OF MY YOUTH. ANNOUNCERS SPENT ABOUT 80% OF THE TIME THEY WERE TALKING TO TELL PEOPLE TO GET HOOFS UP OFF CURB. YES YOU. GET FEET AND PAWS AND HOOFS OFF CURB. YOU IN THE RED SHIRT. THIS MEANS YOU. READY UP ABOVE? READY DOWN BELOW? I GUESS THEY NOT HAVE WALKY TALKYS FOR THIS. SPORTHORSE LOOKING FORWARD TO WHEN OWN PROGENY CAN RUN RACES. I MEAN I AM HORSE, SO I MEAN HORSE RACES, BUT FISHBOX DERBY NOT A BAD BACKUP. 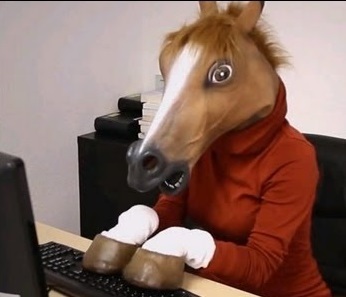 WELL UNTIL HOCKEY STARTS, OR I HAVE TIME TO WATCH A FOOTBALL GAME, THIS IS SPORTHORSE SIGNING OFF.